Description: Small tree or shrub to 3 m tall; branches thorny, the thorns purplish brown, 3-4 cm in length; leaves simple, alternate and rhombic in outline, margins with 3-4 broad lobes on each side of the upper two-thirds of the leaf, these lobes with fine marginal teeth that are not strongly glandular-tipped; flowers with 5 white petals and 5-8 stamens, carpels 1-5, hard and bone-like with each enclosing 1 nutlet; fruit a pome. Flowers April to June. Similar Species: Crataegus erythropoda has leaf margins that are not distinctly lobed and the marginal teeth are glandular-tipped. Distribution: New Mexico, Catron, Grant and Lincoln counties, Pinos Altos and Sacramento mountains. Habitat: Canyon bottoms and forest understory in lower montane coniferous forest; 1,900-2,500 m (6,500-8,000 ft). Remarks: This species is closely related to Crataegus erythrocarpa and possibly C. macracantha, a more northern species. The distinction between C. wootoniana and C. macracantha var. occidentalis needs further study. Conservation Considerations: Additional field surveys are needed to determine the abundance, distribution, and habitat requirements of C. wootoniana. The effects of forest fire on this species have not been studied. Carter, J.L. 1997. Trees and shrubs of New Mexico. Johnston Books, Boulder, Colorado. Eggelston, W.W. 1907. 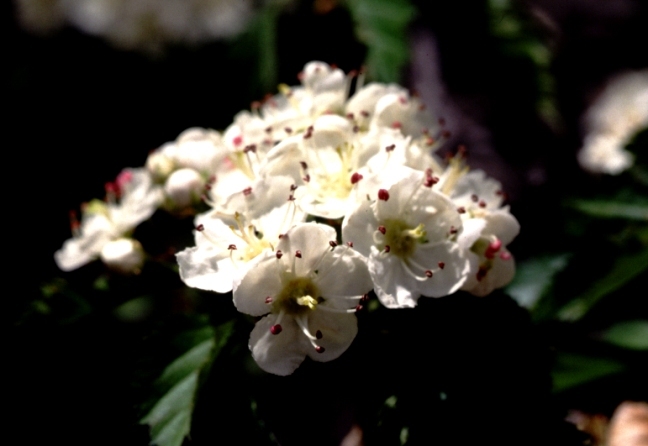 Crataegus in New Mexico. Torreya 7:235-236. Martin, W.C. and C.R. Hutchins. 1980. A flora of New Mexico, vols 1-2. J. Cramer, Vaduz.